This highly concentrated precision corrector visibly reduces the appearance of dark spots, age spots and existing imperfections. For dull, pigmented skin. The ELEMIS Brightening Complex of encapsulated Vitamin C, Pea and Daisy is blended with Garden Cress, rich in a powerful anti-oxidant phytonutrient, to help reduce the intensity of dark spots without affecting the surrounding area. Leaves the skin looking more even and unified. Easy brush applicator targets key areas of concern on the face, neck, décolleté and hands. Aqua/Water/Eau, Butylene Glycol, Methyl Methacrylate Crosspolymer, Coco-Caprylate, Adipic Acid/Neopentyl Glycol Crosspolymer, Polyacrylamide, Glycerin, Phenoxyethanol, Sucrose Dilaurate, Hydroxyacetophenone, Laureth-7, Hydrogenated Polydecene, Polysorbate 80, Alcohol, Disodium EDTA, Fragrance (Parfum), Polysorbate 20, Lecithin, Bellis Perennis (Daisy) Flower Extract, Pisum Sativum (Pea) Extract, Caprylyl Glycol, Lepidium Sativum (Garden Cress) Sprout Extract, Citric Acid, Linalool, p-Anisic Acid, Myrocarpus Fastigiatus (Cabreuva) Oil, Soy Isoflavones, Sorbic Acid, Limonene, Ethyl Ascorbic Acid (Vitamin C), Citrus Nobilis (Mandarin) Oil, Alcohol Denat., Phenethyl Alcohol, Lonicera Japonica (Honeysuckle) Flower Extract, Benzoic Acid, Lonicera Caprifolium (Honeysuckle) Flower Extract, Elettaria Cardamomum Seed Oil, Anthemis Nobilis (Chamomile) Flower Oil, Melissa Officinalis Leaf Extract, Dehydroacetic Acid, Nonapeptide-1, Dextran. Garden Cress brightens the skin, by reducing the effects of external stressors, helping to fade the appearance of discolorations, for a more even skin tone. Twist pen until product appears (approximately 4-5 full rotations clockwise upon first use). Apply to areas of dark spots on a cleansed skin or immediately after White Brightening Even Tone Lotion. Use morning and evening on the face, neck, décolleté or hands. For optimum results, follow with Even Tone Lotion and Serum as part of the White Brightening program. This product is just so very clever as it allows you to target just the dark spots you wish to fade individually. I have used it for 2 weeks now and the age spots I have targeted have lightened considerably. There is no wastage as you are able to apply this just where it is needed. I have had no reaction to this product just the pleasure of seeing my dark spots fade away. It worked perfectly on me. I'm glad my friend referred me this product. I had sun damage on my upper lip area that looked like mustaches. After finishing two bottles of this product all of the darkness in the area has been disappeared. You have to be patient. It really works. This looks like a stylish and slick pen and is a good design for what is required to use it. I used it morning and night for a couple of weeks and did see fading on the dark pigmented area on my face. I did not suffer any reactions, in fact, I'd prefer it if it was even a little stronger! I would recommend this if you have large freckles or pigmented areas. You need to use it regularly though and continuously, otherwise, in my experience, the pigment does return. I have used this product for about 4 weeks on a freckled area on top of my cheek bones and I can really see the difference. The freckles/dark spots have faded and they look more blended with my skin tone. The packaging is a little fiddly as it is taking a lot of twists for some product to come out but it could be just my pen. I have used up the whole corrector on just 1 darker spot and there is only very slight fading. I would need awfully big quantities of this corrector to make any difference. In which case, laser is better option. I got this product at Equinox Spa where I get my facials (I was practically "pushed" into this unknown brand to buy. Despite its main purpose I don't have pigment problems, however I had a few discoloration spots from 'getting into pimples' myself...Well, it's a waste of $$ and I ran outta of it too quickly. The texture and scent were pleasant, but I'd rather stick to my other favorite Korean skincare line and stop 'trying new things'. 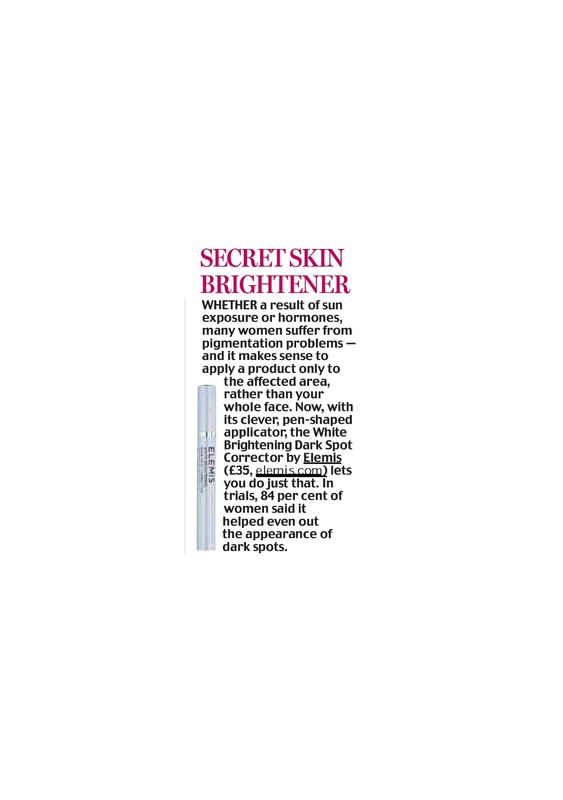 "In trials 84 per cent of women said it helped even out the appearance of dark spots"